Drought continued to expand across Oklahoma this past week with triple digit temperatures and little rain forcing the the expansion. 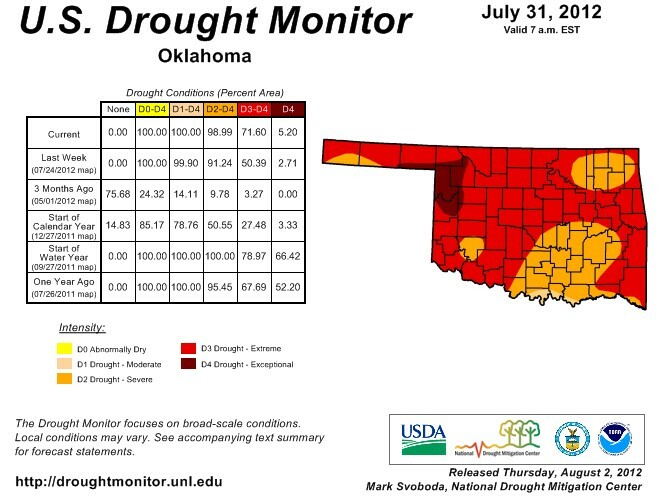 The latest report, dated July 31, 2012 and released on Thursday morning, shows 98.99% of Oklahoma in Severe to Extreme to Exceptional Drought- most of that in the severe to extreme categories. That's up from 91% one week ago, and atually higher than the 95% we had one year ago- although the majority of the state was already in exceptional- D4 Drought- by this time in early August. The Oklahoma Drought Monitor map is above. Below, we show the National Drought Monitor map- the heartland continues to face drought conditions not seen in decades. Missouri is rated at 100% severe to exteme to exceptional drought, with the D4 Exceptional drought rating found in the southeastern corner of Missouri, in the famed Missouri bootheel, along the Mississippi. To access the US Drought Monitor website to see other regional graphics- click here.